John and Mia are a young Catholic couple in California that are starting out their lives together in the late 1960s. John is a med student about to start his residency and his wife Mia is an expectant mother. One night their home is invaded by members of a satanic cult bent on killing someone. While the cultists are killed by police before they can do any apparent harm, they manage to leave behind something that is far worse than any physical harm they could have inflicted. 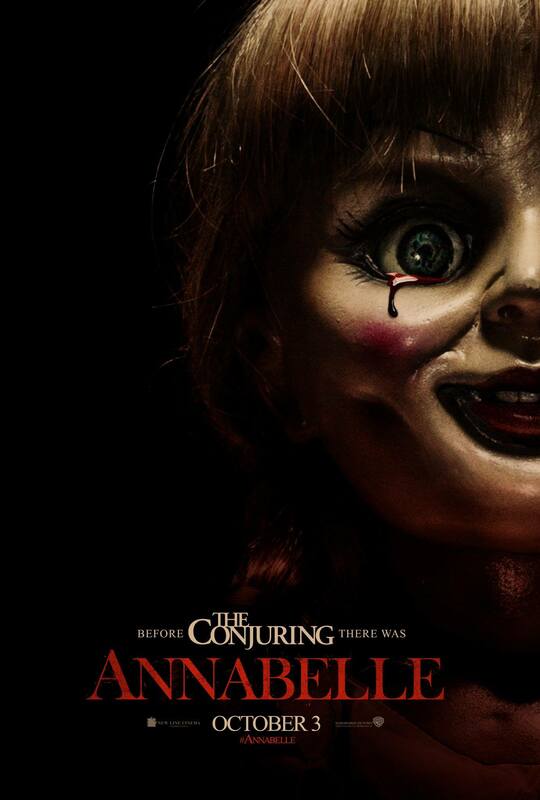 Annabelle is a spin-off / prequel to the super successful horror hit of 2013, The Conjuring. The story is written by Gary Dauberman and directed by John Leonetti and stars a couple of TV actors in Annabelle Wallis and Ward Horton. Also appearing in supporting roles are Alfre Woodard and Tony Amendola. The movie is a thinly veiled attempt to capitalize on the huge financial success of The Conjuring. Sadly, it is nowhere near the movie that its predecessor is. That being said, it wasn’t a bad movie; it just didn’t live up to my preconceived expectations. For the first 45 minutes of the 98 minute movie I was genuinely uncomfortable in my seat. Each scene brought something unnerving to the table; whether it was the imagery of Mia sewing with her fingers much too close to the movimg needle of the sewing machine, the way the camera focused on the doll and you expecting it to move, or the various regular household sounds that were distorted into something sinister. It was scary in a way that made you feel like Leonetti, the director, was using a scalpel to slowly cut away at your defenses to really “get” you later on. At about the halfway point in the movie something goes horribly wrong and Leonetti abandons his scalpel and goes for a machete. From that point on, the “scares” stop being scary. The scenes that should be thrilling or exciting feel more like the filmmaker trying too hard to be shocking. The great uses of sound and imagery that made the first half of the movie great are all but abandoned. In the end, the movie that had such potential ends up being, “just another demon/possession movie.” You have you a witless victim, her doting husband, the Catholic priest, and the helpful expert. Of course the priest has a bad day and the witless victim makes every clichéd mistake that has ever been made. No real surprises in the story telling at all but I guess, all things considered, it could have been worse. If you feel like you simply have to see this movie, take a step back and look at the $25 you were about to spend to see it in the theatres and think of some other way you could use it. You will only need about $1.50 to see it in Redbox in about 6 weeks. I’m a horror movie fan – I’m a fan of the original evil dead trilogy to Romero to Poltergeist, korean horror, french horror etc… I’m also a fan of the new wave of horror. I’m a fan of the Conjuring as it was a film that made me think the art of a horror movie is back. First off… this isn’t made by James Wan… it’s made by it’s filmographer so off of the bat you’re probably going to get some cool scenes but perhaps lack of character development. The budget of Annabelle is $5 million (that’s 1/4 of what the Conjuring cost). Let me tell you the script is the weakest part of this film. The movie starts off slow… this is where the film should really get you into the characters but there isn’t much here, it’s generic. It’s the weakest part of the film. You have your standard couple… man goes to work, woman stays home and experiences weird stuff. The problem with this is that it’s hard for you to bother to relate to the characters. This kind of kills the film for me. There were actually a lot that could have been explored but they didn’t touch like the kids in the apartment. Now the good. There is very little CGI – perhaps none. It’s all old school. This is something that anyone could actually film…. chair moving, oven is on, someone standing there. It’s good. It works. There’s a great scene here with a baby. Are there enough scares? Not really. The pay off for the film felt like they might have fixed the movie for censors but even though the film is Rated R.
There’s a lot missing in this film. It’s not horrible. It’s worth a rental. It’s your average horror movie.